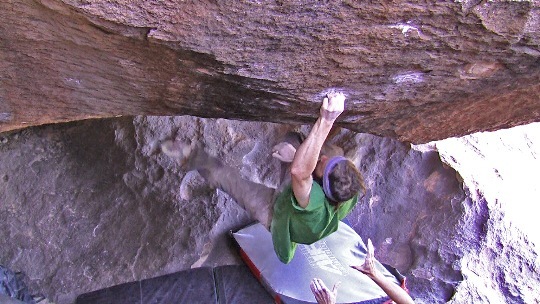 Paul Robinson made his return of sorts to outdoor bouldering this past weekend at the Hueco Rock Rodeo. Apparently spending the past 5+ months rehabbing from his broken ankle hasn’t slowed him down much. In fact, his performance at the HRR combined with his performance at ABS Nationals last month makes it look as though Paul is as strong as ever. During the comp he repeated Terre De Sienne (V14), Diabolique (V13), Algerita (now solid V13 after a broken hold), El Techo De Los Tres Bs (given V13 for the comp but now considered easier due to a recent hold break), Diaphanous Sea (V12) and Loaded Direct (V12). A nice total of 77 V points in only 6 problems! Close on Paul’s heels in 2nd place was Matt Wilder who had a great day himself. Wilder did the 6th ascent of Terre De Sienne as well as 1 V13, 3 V11s and 1 V9/10. Big ups to Andy Mann for winning the photo contest as well. ← Where In The World Is Chris Sharma? Wow Narc delivers! Thanks bro, that was fast work. Yeah, Garret was super impressive at ABS Nationals as well. I think he and Julian Bautista are two of the young guns to watch out for in the next few years. bloody nice guy as well, I talk to him alot for holds and various other things that need to get done day to day with running a website. He always seems chill, busy as hell, but always chill. You’d never guess he was such a mutant!! El Techo is considered easier due to a recent break. Thanks, I updated the post to make that a bit more clear. Does anyone know which problems Thomasina did to put her in first place?